Oh, I am loving these pops of orange against the green… fabulous! I ran across Chad’s work on Facebook and was loving every single piece… I was having a horrific time trying to find one image that I really loved on his website because each and every one is just so wonderful! On Chad’s website, when you click on PORTFOLIO you’ll have some options. Maroon Street Poppies is located under FIELD WORK TEST. If I ever complete a painting that is close to being as fabulous as this is you will hear me yodel from a mountaintop somewhere. Ha ha… not kidding! I love light in a painting and this is just so perfect… Check out his work, I’m sure you will love it as much as I do! I really like it when artists share who they’ve studied with. Kenn Backhaus and Marc Hanson… whoa! I love their work! They’ve both “got the eye”… and they can transform a canvas into what they see which is breathtaking and ALWAYS a treat! Oh, and you can’t forget about Mother Nature…! Painting plein air is challenging to say the least. You have got to be organized and pretty quick at what you do… no time to dilly dally when the sun moves at such a fast pace (which you would never realize unless you’re trying to paint and the shadow that was once there is now quickly gone)! Chad Smith’s (b.1970) most influential instruction came through private full-time atelier study with Douglas Flynt via Jacob Collins and the Water Street Atelier. 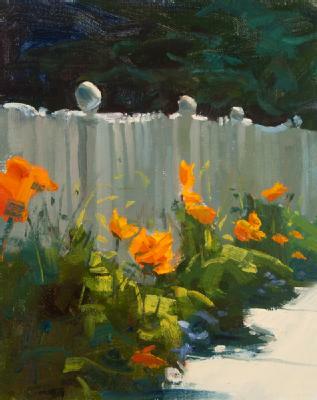 Smith has studied plein air and studio landscape painting with Kenn Backhaus and Marc Hanson. Smith previously studied classical academic drawing and painting concepts with Frank Covino, Don Maitz and David Meo. Smith has also studied figure and animal drawing with famed Disney animator and teacher Glenn Vilppu and Joe Weatherly. He graduated with a BA in Drawing and Painting from the State University of New York and is presently finishing graduate MFA work at the Academy of Art University. Charleston Photo… Don’t walk without a camera! Poe’s Tavern – Sullivan’s Island, SC! Enjoy both the colors and the vertical lines in the painting. Back to normal again? Me too! Yep, back to normal… my parents have gone back home, boo hoo, miss them already! Have a great day Kate!